Welcome to Lorewood's testing phase! This post will have the most recent version of the testing download. 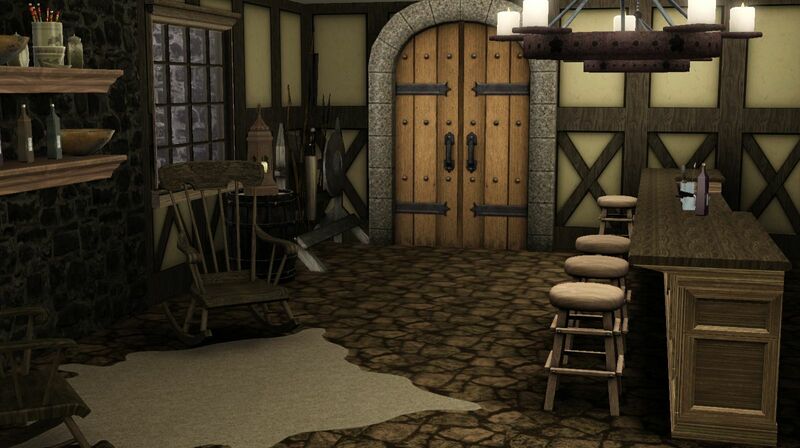 Click here for the download that does not use RH rugs. Currently we are working in Lorewood lite... Just ironing out basic routing issues, floating objects, and general silliness. If you want to help testing, please, we welcome extra sets of eyes! Add a quick post of any issues you see, as well as the location, and a screenshot if possible. It helps me find the trouble spot so it can be addressed more quickly. If you have an awesome idea for a lot, throw it in here so we can look at it and see if it fits with the concept of the world. 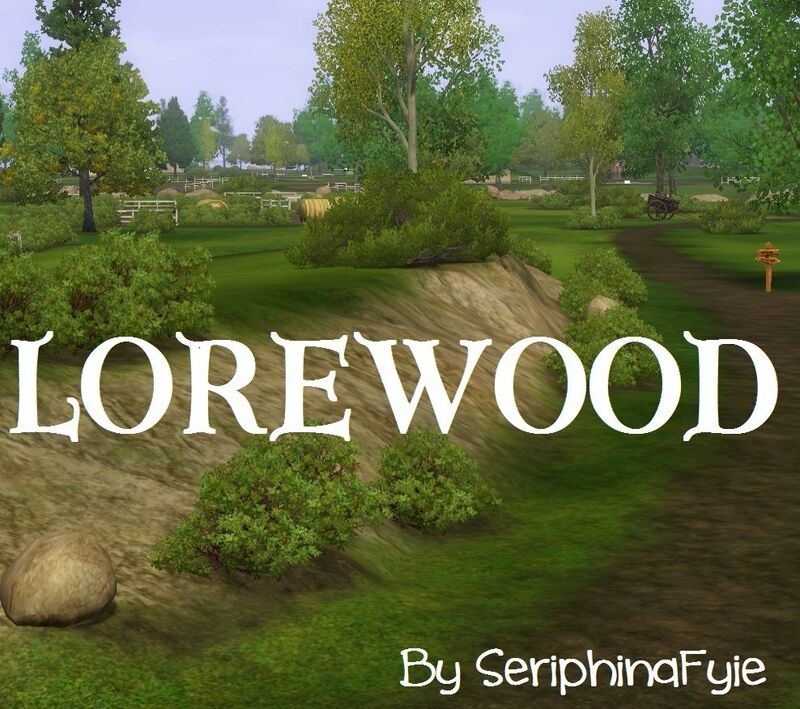 Thank you for keeping up with the progress of Lorewood! Routing failure at Tranquil Dock. Fixed campfire and dock stairs, as well as floating tree. Can't "swim in ocean" though action comes up repeatedly Fixed removed majority of non-routable paint. No stoves in current residential lots. Fixed, added stoves. Fixes will appear in next update version. 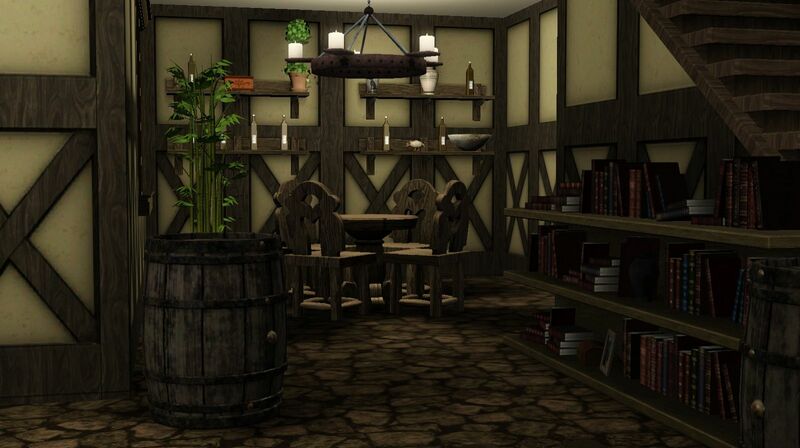 Tavern in Forbidden Forest completed. Removed Beehive and Chicken Coop from farm near Legacy plot. Felt a little cheaty to have it so available. May still remove some of the harvestables there. Added base items and notations to lots for planning purposes. Changed color of Monastery, Nectary, and Cathedral to better compliment the Keep Walls. It's fairly subtle, but more yellow/orange than it was. Updated the walls and floors in the Hunting Lodge, added activities, swapped out the bathrooms for outhouses. I just wanted to show the difference of changing the color of the Monastery, Cathedral, and Nectary so you can see what a difference it can make. Since I'll use the same wall sets/stone for the actual castle buildings (inside the keep wall), I wanted to create a bit of flow. 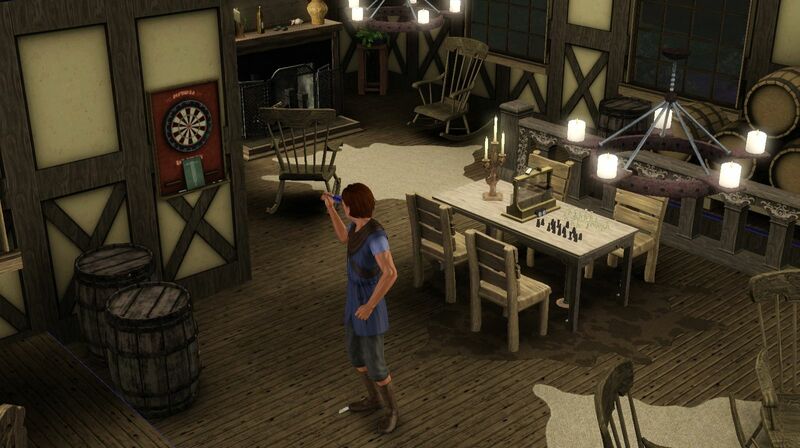 Getting some work and testing done on one of the several taverns in the world. This one does not have a sleeping area. I LOVE IT!!!!!!! nuff said. 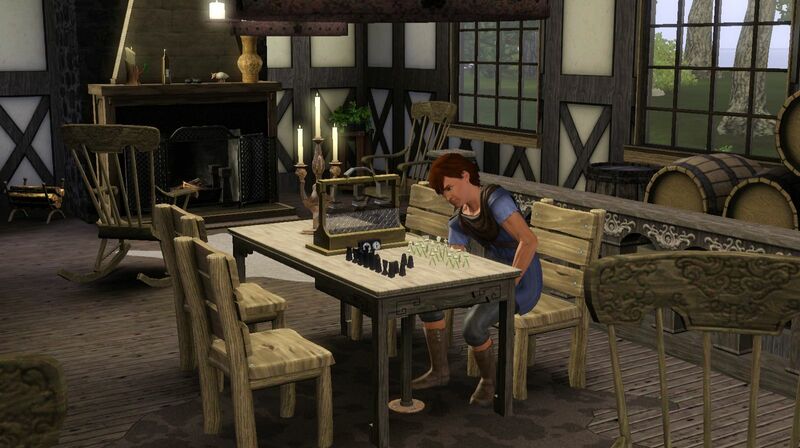 Love that chess table. Good thinking! 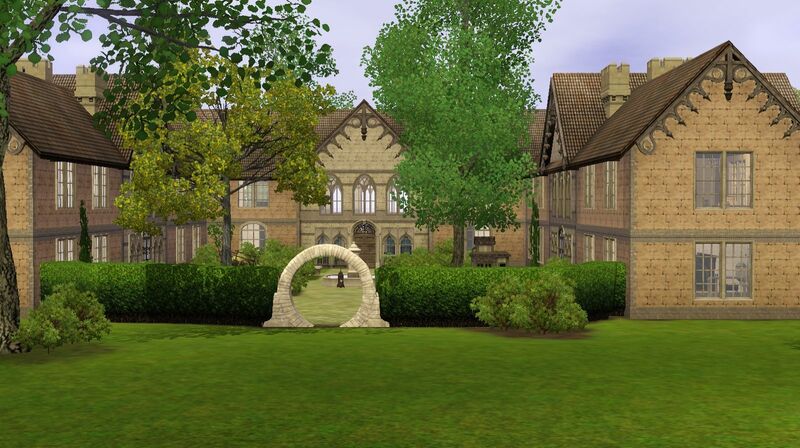 Will you be creating a version of the world with the rabbit hole rugs and/or doors in place? 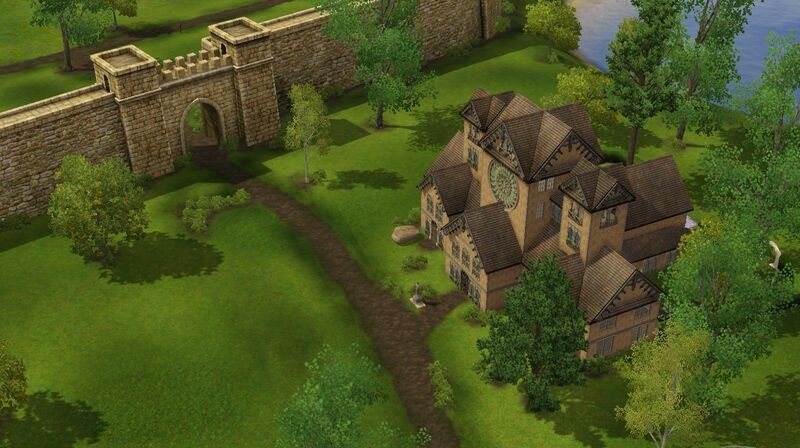 I know you are just holding the place for the gypsy wagon here, but I would love to have a version with the alternate versions, with your builds around them! At the nectary, when Wendy first went there, she went to the back door. 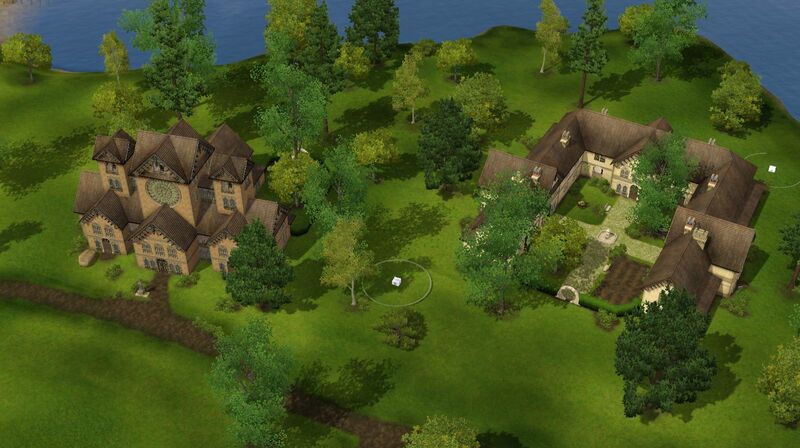 So I had her "build on lot" and set the front of the lot where the circle shows, here. Then I had her to away and come back. She SHOULD have see the first door along that front line and gone to it, but it didn't happen. ...until she reached the back door again. I tried having her set the front door, but that isn't one of the doors that will allow that to happen (silly EA). 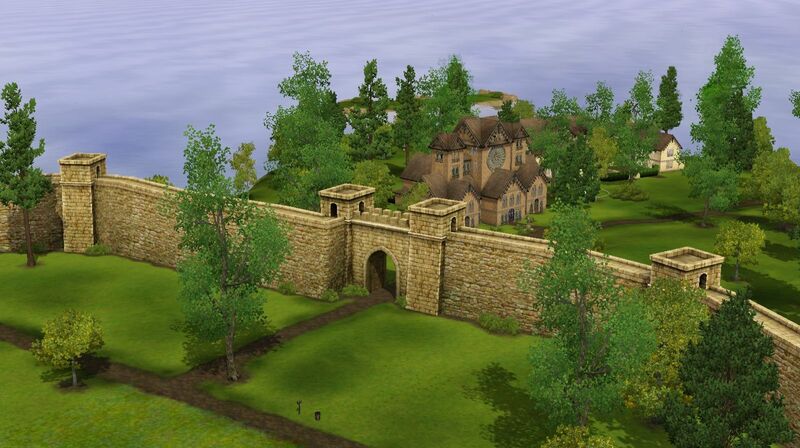 I'm wondering if a little stone fence or some rocks or trees or something over at the far sice would keep Sims from going all the way around. Or...??? The paper kid still comes, of course. For Wendy, I'm having her hide her papers under the trash can. Once the papers get up to the max, the paper kid will no longer deliver them to her, at least. I'm not sure, but I don't think it holds up the paper system for all lots, unfortunately. I spent some time playing and upgrading Wendy's little home a bit, before I went into testing mode. She has a few more lamps, now, and one hanging outside her front door. She also has moved her sink over by her oven, which is moved over by the wall. I put a round wooden end table under the sink, and put another one to the left of the counter, appropriately recolored, and put one of her new lamps on the end table by the door. Also, I recolored the fireplace to match the oven and counter, and moved her sleeping bag so she has her head in the corner and her feet by the fire, along the back wall. She can't afford any flooring yet. She does, however, have another apple tree and two new tomato plants. She also has some garlic and onions she can plant later (harvested somewhere over by the nectary yesterday). I haven't found it yet, if you put it in, but didn't you say you were going to use the market carts somewhere? If you hadn't been thinking of it, why not add in a farmers' market lot. Or did I just miss it? Haven't been everywhere yet. I was looking, because I want Wendy to be able to sell her produce to get more funds. I thought maybe she could sell them at the nectary register, but the only thing she can sell there is nectar. Now I'm thinking I could put one of those carts out in her front yard to sell to passers-by! Would that work? No tears anywhere on that island, as far as I can see. 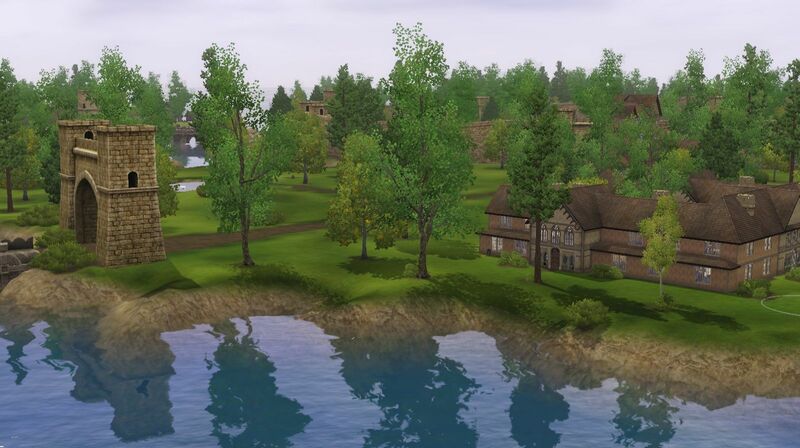 Everything looks great, landwise, and I haven't seen any floating trees or anything. Okay... to start, you can actually cancel the newspaper delivery through the phone. "Call for services", it's in the menu that pops up, "cancel newspaper delivery - free." No need to squirrel them away on the lot anywhere! Speaking of the phone, you can also silence the ringer. As she meets people, invariably they start to call and that just doesn't suit for this world. The market cart: Yes, I intend to have a couple of them in the world. They will NOT be out all year though, only Spring through Autumn. Some days you may show up to buy produce and find the cart missing (Construction Phase), so not as reliable as being able to feed your family from your own garden. I'm not sure how the market carts work on home lots as I've never tried, but I remember something about you being able to do that. Worth a shot once she has some money! Rugs/Doors... YES! I'm building the rabbit holes. Even the ones that I package for general consumption will include the rabbit hole in the basement method, so no ugly premades. Everything will maintain good flow. Sounds like your remodeling was lovely. I've actually made a few changes to the challenge house, including a fridge and stove in place of the brick oven. As far as the door situation... Not sure what to do there. Setting front of lot and setting front door never seems to stick. I can just put a small fence extension from the area with the vines, that would put the door into a room instead of outside. 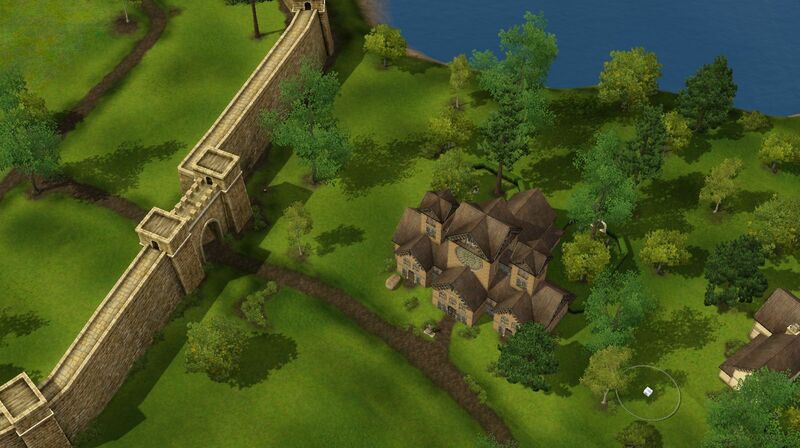 The newest version of the world will be up on Friday with several changes and a few lots built out. Hopefully that will make the testing a little more enjoyable with more things to do. I had no idea about the paper! There's plenty to do, but looking forward to seeing more. I'm gonna move the chair & try it again. Oh, I just remembered....I still have my testing cheats on. Would that cause it? Testing cheats can cause problems. Always turn them off. Did you use moveobjects to place the table? Seems like a gameplay glitch. Also, check that your mods are up to date. Did you happen to move the chair with the Sim in it? 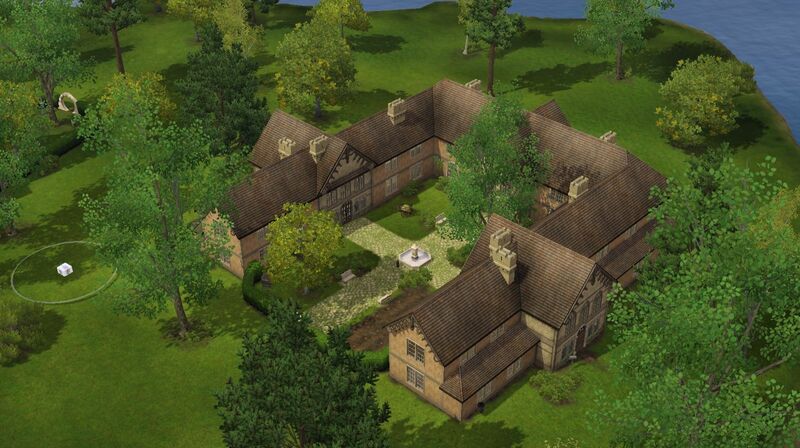 In TS4 if you do that, the Sims pop up and stand around waiting for you to finish. 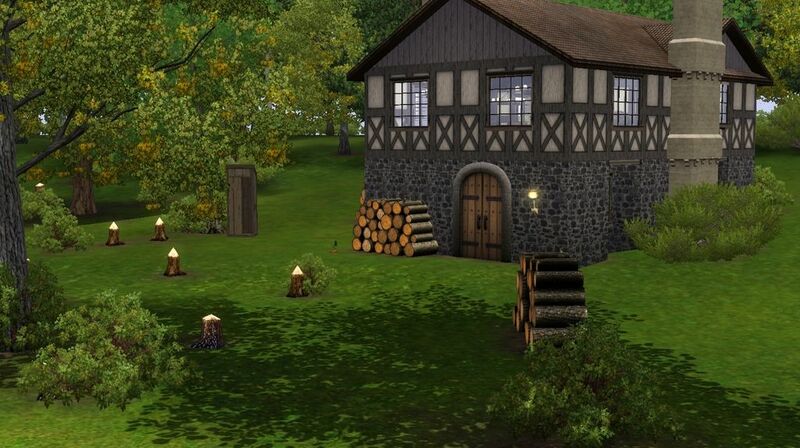 In TS3, they would do weird things...like the way that poor guy is sitting! If not...probably just testing cheats & move objects together.